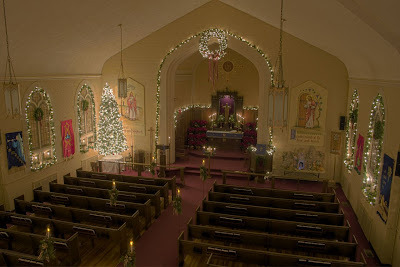 Check out Pastor Weedon’s Church – All Christmassy! This is Pastor Weedon’s church – looking like a cross between the parish church of my youth and that big house down the street with all the Christmas lights. Well, ever since his first Christmas address to the Curia in 2005 when he floated his “hermeneutic of continuity” idea in relation to Vatican II (a phrase now “up there” with “dictatorship of relativism” as an iconic phrase of this pontificate), Vatican watchers have eagerly awaited the Holy Father’s annual address to his henchmen (and one or two women). The English is yet to come out, but the Italian is here, and CNS has a news report here. Nothing controversial this year, it appears (unless you think that the linking of the Church’s doctrine of Creation to the Church’s doctrine of marriage is controversial – see here). Friedrich Nietzsche ha detto una volta: “L’abilità non sta nell’organizzare una festa, ma nel trovare le persone capaci di trarne gioia”. Who said "distinction between state and Church…is a great progress…"…and a fundamental condition for [the Church’s] very liberty…"
“…and the fulfillment of her universal mission of salvation among all peoples”? This brief visit is propitious for me reiterate how the Church is well aware that “the fundamental structure of Christianity is the distinction between what is Caesar and what belongs to God (cf. Mt 22.21), namely the distinction between state and Church “(Encyclical Deus Caritas Est, 28). This distinction and this autonomy is not only the Church acknowledges and respects, but they welcomed as a great progress and a fundamental condition for his own freedom el’adempimento of its universal mission of salvation among all peoples. At the same time, however, the Church feels like his job, following the dictates of its social doctrine, argued “from what is consistent with the nature of every human being” (ibid. ), to awaken society and moral forces spiritual, helping to open the will to the genuine needs of the property. Therefore, invoking the value they have for life not only private but also and above all public some fundamental ethical principles, in fact, the Church helps to ensure and promote the dignity of the person and the common good of society, and in this sense is realized l ‘Desired real cooperation between church and state. That appears to be more or less where we wound up our discussion on the pros and cons of the “Catholic Confessional State”. Well, the line was huge in the Cathedral today. One line started a hour before mass and was still going half an hour afterwards. I must say I have something of a difficulty with the “examination of conscience” thingy. It is very easy to get stuck in a rut – to always be quick to recognise those familiar sins in one’s life, but to allow others to go straight through to the keeper without noticing them. While teaching Galatians this past year, I found Chapters 5 and 6 especially useful in guaging where I was at spiritually. So, how would it be if, rather than just use the 10 Commandments, one were to make a practice of reading those passages in the bible which clearly spell out what, in God’s eyes, are sins and what are virtues? Would that help? I have found that it does – and here is a neat little page to get you started. Print it off and park it in your prayer book or missal. And now get thee off to the box (time is running out! ).